Alternative safe, effective, minimally invasive, and reversible weight-loss surgeries are needed to bring about sustained and clinically significant weight loss in patients for whom drug therapy or bariatric surgery are not indicated, or who do not want to undergo bariatric procedures that are invasive, irreversible, and bring a higher risk of short- and long-term adverse events. The Maestro RC2 device, a vagal nerve blocker positioned laparoscopically, could satisfy the need for such an alternative approach to inducing weight loss in obese patients. Compared with evidence concerning available bariatric surgeries, the combination of a better adverse event profile and significant but less striking weight loss observed in the first 24 months of the ReCharge trial suggests the promise of vagal nerve blockade therapy. The Maestro device includes two internal electrodes, an integrated coil that serves as an antenna for telemetry and recharging, a rechargeable lithium ion battery with an estimated eight-year life, and an external battery-powered controller.2-7 The device is typically implanted during a 60- to 90-minute laparoscopic procedure. 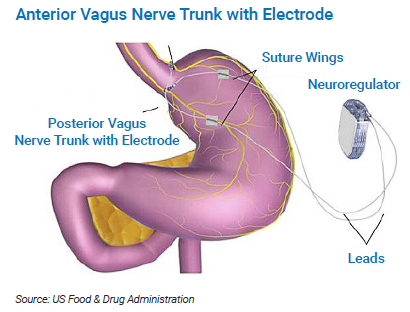 The electrodes are placed on the dissected anterior and posterior vagus nerve trunks to block both afferent and efferent signalling.2-5,11 The neuroregulator is placed in a subcutaneous pocket within the thoracic sidewall. A link between the internal and external components is established, and the device is programmed via a transmitter coil and proprietary software that can be loaded onto a laptop. Radiofrequency signals transmitted transcutaneously (≥ 5 cm away) permit the device’s activation/deactivation, the retrieval of diagnostic data, and the modification of treatment parameters. The device can be recharged using either an external mobile unit worn by the patient or a standard, external AC charger. Therapy cannot be delivered during recharging. Patients typically perform daily battery checks and undertake recharging as needed. The device can be removed if necessary. BMI = body mass index; FDA = US Food and Drug Administration. The choice of surgery depends on obesity severity, comorbidities, surgeon experience, individual patient preferences, and/or other contraindications.60 Some are routinely performed in minimally invasive ways (e.g., laparoscopic adjustable gastric banding [LAGB], reversible). All results from the 12-month, double-blind (i.e., participants; outcome assessors) portion of ReCharge — a five-year, phase 3, pivotal, randomized controlled trial ([RCT] NCT01327976) — have been made public,2 as have the 18-month7 and 24-month efficacy data (Dan Cohen, EnteroMedics Inc., St. Paul, MN: personal communication, 2015 March). Drawing participants from 10 sites (US, Australia), the trial randomly assigned (2:1) 239 morbidly obese adults to undergo laparoscopic implantation of either the Maestro RC2 device (n = 162) or a sham neuroregulator (n = 77) via the same five incisions. Participants were adults, aged 18 to 65 years, who had a BMI of 40 to 45 kg/m2 (class III obesity) or 35 to 39.9 kg/m2 (class II obesity) with one or more obesity-related conditions (e.g., hypertension, dyslipidemia, sleep apnea syndrome, obesity-related cardiomyopathy; up to 10.0% of patients with type 2 diabetes mellitus), and had failed at least one supervised weight management program in the previous five years. The sham did not include lead placement, and its current was dissipated into an electronic circuit within the device. Sham incisions did not result in peritoneal penetration. The “live” device was programmed to deliver VBLOC therapy for at least 12 hours daily. All patients received weight management education, but none were prescribed a diet or exercise regimen. Exclusion criteria included a known genetic cause of obesity, type 1 diabetes mellitus, and clinically significant hiatal hernias (> 5 cm) or other esophageal problems (e.g., varices or dissection). The ReCharge trial remedied design limitations that had characterized the EMPOWER trial (see Benefits), a multi-centre (US, Australia), double-blind, 12-month RCT (NCT00521079) with 294 patients, mostly female (90.0%), aged 18 to 65 years with a BMI of 40 to 45 kg/m2 or 35 to 39.9 kg/m2 with one or more severe obesity-related conditions, and who had failed to achieve satisfactory or sustained weight loss with diet, behavioural intervention and/or pharmacotherapy. Patients were randomly assigned (2:1) to be implanted with an activated VBLOC system (n = 192) or an “inactive” control device (n = 102).4,72 Main outcomes were per cent EWL at 12 months, and serious adverse events. Patients controlled the duration of therapy using an external power source. Devices in both groups were subjected to regular, low-energy safety checks. After the initial 12-month period, patients were to be followed for another four years. Twelve-month data have also been reported for an open-label, prospective yet uncontrolled study of obese patients (BMI of 30 to 40 kg/m2) with type 2 diabetes mellitus and elevated blood pressure (n = 28, 5 centres, NCT00555958).3,5,73-77 It investigated the potential long-term impact (up to 60 months) of at least 12 hours of daily VBLOC — to a maximum of 15 hours — on EWL, glycemic control, blood pressure, and the occurrence of serious adverse events as well as unanticipated adverse effects. All patients received 17 individual weight management/counselling sessions. FDA approval was based on ReCharge 12- and 18-month data, even though neither of the primary efficacy objectives was met.2 The mean between-group difference in per cent EWL in the intention-to-treat population was 8.5 points in favour of VBLOC (95% CI, 3.1 to 13.9), which failed to attain the target 10-point margin (P = 0.71); the mean per cent EWL in VBLOC and sham patients was 24.4% and 15.9%, respectively. Multiple imputation analysis revealed that the mean per cent EWL was 9.2 points higher in the VBLOC group (26.1% versus 16.9%; 95% CI, 2.7 to 15.6), and 52.5% of VBLOC patients achieved an EWL of 20.0% or more, with 38.3% exhibiting a loss of 25.0% or more. This compares with 32.5% of sham patients who achieved a loss of 20.0% or more and 23.4% who experienced a loss of 25.0% or more. Post-hoc analysis indicated that weight loss in VBLOC patients was statistically greater than in sham patients. Somewhat longer-term ReCharge data suggest that the weight loss seen at 12 months was maintained. At 18 months, the mean per cent EWL in the VBLOC and sham groups was 25.2% (95% CI, 20.6 to 29.8) and 11.7% (95% CI, 5.4 to 18.0), respectively, with a difference of 13.5% (95% CI, 5.7 to 21.3).7 The mean per cent EWL at 24 months was 21.0 ± 25.1% (95% CI, 16.1 to 25.9) and 3.9 ± 14.3% (95% CI, –2.3 to 10.1) in the VBLOC (n = 103) and sham groups (n = 23), respectively, with a difference of 17.0 ± 23.6% (95% CI, 9.3 to 24.8; P < 0.001) (Dan Cohen, EnteroMedics Inc., St. Paul, MN: personal communication, 2015 March). Twelve-month per cent EWL did not differ significantly for the two groups in EMPOWER: 17 ± 2% and 16 ± 2% for VBLOC and control patients, respectively.4,72 But, clinically important weight loss was related linearly to hours of device use; VBLOC and control patients with at least 12 hours of daily use achieved 30 ± 4% and 22 ± 8% EWL, respectively. Treatment group patients who received at least 12 hours daily of VBLOC therefore achieved the level of weight loss anticipated in the design. Even so, the significant dose response of weight loss in relation to hours of device use for both groups, coupled with the possibility that control patients may have received some degree of VNB as a result of low-energy safety or device checks, confounded the interpretation of the trial results. This scenario necessitated conducting what became the ReCharge RCT, in which the device consistently delivered at least 12 hours of VBLOC daily, while the sham could not deliver any VNB therapy. The VBLOC intervention in the ReCharge RCT was well tolerated, and the primary safety objective was achieved.2 The rate of serious adverse events linked to the device, implantation/ revision or therapy in VBLOC patients at 12 months was 3.7% (95% CI, 1.4 to 7.9), which was significantly lower than the 15.0% target (P < 0.001). Adjudicated causes included: neuroregulator malfunction (n = 2), pain at neuroregulator site (n = 1), atelectasis (lung collapse/closure, n = 1), emesis (n = 1), and gallbladder disease (n = 1). Various events (n = 9) followed the general surgery: nausea (n = 6 of 9), intraoperative oozing, complicated liver biopsy, and moderate ileus of the stomach. When these two classes of serious adverse events are combined, the rate is 8.6% (95% CI, 4.8 to 14.1); this contrasts with no such events in the sham group. The most common therapy-related adverse event was pain at the neuroregulator site. Ninety-six per cent of the pain-related events in VBLOC participants were mild or moderate; yet in three cases, pain required a revision and in one case, an explant. VBLOC participants reported mild or moderate heartburn and dyspepsia, abdominal pain, dysphagia, and belching more often than sham participants. Typically mild or moderate nausea also occurred more frequently in the VBLOC group. In the EMPOWER RCT, the use of VBLOC to treat morbid obesity proved to be safe.4,72 Few serious adverse events were associated with the device (n = 4), or its implantation or revision procedure (n = 5). No serious adverse events were linked to the therapy, and few were related to the surgery/anesthesia (n = 4). It has been assumed that the reliable and effective administration of VBLOC within hospital or specialist care settings requires appropriate preparation and oversight. Surgeons must receive special training and certification to reliably and safely implant and explant the Maestro device.7 Other implementation-related issues are raised in the following paragraphs. An independent panel of experts recently estimated that VBLOC would likely have a small financial impact in the US (level 2/5 rating), and that its cost would likely be comparable to other weight-loss surgeries.87 The cost for LAGB placement can range from US$17,000 to US$30,000, from US$20,000 to US$35,000 for an RYGB,88 and about US$30,000 for a gastric bypass89 (although it is unclear whether this third figure includes both the device and the surgery).87 An EnteroMedics representative has said that the Maestro device’s laparoscopic implantation in the US should cost less than an LAGB or gastric sleeve procedure, yet would be more expensive than lap-band surgery (Dan Cohen, EnteroMedics Inc., St. Paul, MN: personal communication, 2015 March). Data relating to the first-generation Maestro VNB device11 continue to be published.13,14 Other emerging products include various pharmacotherapies, some of which have been used to treat migraine and seizure disorders, depression, epilepsy, or to produce smoking cessation; some are opioid antagonists, while others target leptin, ghrelin, or hormones that exhibit both glucose-regulating and anorexigenic actions.39,92-94 As lifestyle management strategies are routinely being developed, none are highlighted here. To facilitate implementation, EnteroMedics has developed a training and certification program, with guidelines, to identify facilities that are qualified to deliver VBLOC.7 The program includes: classroom training, observation, and supervised implantation; device setup; and a focus on intra-operative and post-operative care. Annual recertification is required. A peer-reviewed literature search was conducted using the following bibliographic databases: MEDLINE, PubMed, Embase, and The Cochrane Library. Grey literature was identified by searching relevant sections of the CADTH Grey Matters checklist (http://www.cadth.ca/resources/grey-matters). No methodological filters were applied, but a human filter was applied. The search was limited to English language documents published between January 1, 2010 and March 10, 2015. Regular alerts were established to update the search until July 7, 2015. Ikramuddin S, Blackstone RP, Brancatisano A, Toouli J, Shah SN, Wolfe BM, et al. Effect of reversible intermittent intra-abdominal vagal nerve blockade on morbid obesity: the ReCharge randomized clinical trial. JAMA. 2014 Sep 3;312(9):915-22. Sarr MG, Billington CJ, Brancatisano R, Brancatisano A, Toouli J, Kow L, et al. The EMPOWER study: randomized, prospective, double-blind, multicenter trial of vagal blockade to induce weight loss in morbid obesity. Obes Surg. 2012 Nov;22(11):1771-82. Camilleri M, Toouli J, Herrera MF, Kow L, Pantoja JP, Billington CJ, et al. Selection of electrical algorithms to treat obesity with intermittent vagal block using an implantable medical device. Surg Obes Relat Dis. 2009 Mar;5(2):224-9. Camilleri M, Toouli J, Herrera MF, Kulseng B, Kow L, Pantoja JP, et al. Intra-abdominal vagal blocking (VBLOC therapy): clinical results with a new implantable medical device. Surgery. 2008 Jun;143(6):723-31. Richards W. Comment on: selection of electrical algorithms to treat obesity with intermittent vagal block using an implantable medical device. Surg Obes Relat Dis. 2009;5(229):30. Sathananthan M, Ikramuddin S, Giesler PD, Laugen J, Rizza RA, Camilleri M, et al. The effect of vagal nerve blockade via overdrive stimulation on response to a mixed meal in non-diabetic subjects [abstract]. Diabetologia. 2012;55:S242. (Presented at 48th Annual Meeting of the European Association for the Study of Diabetes. Berlin, Germany. Oct 1-5, 2012). Buchwald H. The evolution of metabolic/bariatric surgery. Obes Surg. 2014 Aug;24(8):1126-35. Obesity: preventing and managing the global epidemic. Report of a WHO consultation. World Health Organ Tech Rep Ser. 2000;894:i-253. Finucane MM, Stevens GA, Cowan MJ, Danaei G, Lin JK, Paciorek CJ, et al. National, regional, and global trends in body-mass index since 1980: systematic analysis of health examination surveys and epidemiological studies with 960 country-years and 9.1 million participants. Lancet. 2011 Feb 12;377(9765):557-67. Trasande L, Elbel B. The economic burden placed on healthcare systems by childhood obesity. Expert Rev Pharmacoecon Outcomes Res. 2012 Feb;12(1):39-45. Wang Y, Lobstein T. Worldwide trends in childhood overweight and obesity. Int J Pediatr Obes. 2006;1(1):11-25. Kelly T, Yang W, Chen CS, Reynolds K, He J. Global burden of obesity in 2005 and projections to 2030. Int J Obes (Lond ). 2008 Sep;32(9):1431-7. Abiles V, Rodriguez-Ruiz S, Abiles J, Mellado C, Garcia A, Perez de la Cruz A, et al. Psychological characteristics of morbidly obese candidates for bariatric surgery. Obes Surg. 2010 Feb;20(2):161-7. Lehnert T, Sonntag D, Konnopka A, Riedel-Heller S, Konig HH. Economic costs of overweight and obesity. Best Pract Res Clin Endocrinol Metab. 2013 Apr;27(2):105-15. Cawley J, Meyerhoefer C. The medical care costs of obesity: an instrumental variables approach. J Health Econ. 2012 Jan;31(1):219-30. Apovian CM, Aronne LJ, Bessesen DH, McDonnell ME, Murad MH, Pagotto U, et al. Pharmacological management of obesity: an endocrine Society clinical practice guideline. J Clin Endocrinol Metab. 2015 Feb;100(2):342-62. Blackburn G. Effect of degree of weight loss on health benefits. Obes Res. 1995 Sep;3 Suppl 2:211s-6s. Fujioka K. Benefits of moderate weight loss in patients with type 2 diabetes. Diabetes Obes Metab. 2010 Mar;12(3):186-94. Johansson K, Neovius K, DeSantis SM, Rossner S, Neovius M. Discontinuation due to adverse events in randomized trials of orlistat, sibutramine and rimonabant: a meta-analysis. Obes Rev. 2009 Sep;10(5):564-75. Bray GA. Medications for weight reduction. Med Clin North Am. 2011 Sep;95(5):989-1008. Hauser DL, Titchner RL, Wilson MA, Eid GM. Long-term outcomes of laparoscopic Roux-en-Y gastric bypass in US veterans. Obes Surg. 2010 Mar;20(3):283-9. Booth H, Khan O, Prevost T, Reddy M, Dregan A, Charlton J, et al. Incidence of type 2 diabetes after bariatric surgery: population-based matched cohort study. Lancet Diabetes Endocrinol. 2014 Dec;2(12):963-8. Sjostrom L, Peltonen M, Jacobson P, Sjostrom CD, Karason K, Wedel H, et al. Bariatric surgery and long-term cardiovascular events. JAMA. 2012 Jan 4;307(1):56-65. Colquitt JL, Pickett K, Loveman E, Frampton GK. Surgery for weight loss in adults. Cochrane Database Syst Rev. 2014;8:CD003641. Puzziferri N, Roshek TB 3rd, Mayo HG, Gallagher R, Belle SH, Livingston EH. Long-term follow-up after bariatric surgery: a systematic review. JAMA. 2014 Sep 3;312(9):934-42. Bray GA. Obesity in adults: overview and management. 2015 Jan 28 [cited 2015 Apr 13]. In: UpToDate [Internet]. Waltham (MA): UpToDate; c2005 - . Available from: www.uptodate.com Subscription required. Eid GM, Brethauer S, Mattar SG, Titchner RL, Gourash W, Schauer PR. Laparoscopic sleeve gastrectomy for super obese patients: forty-eight percent excess weight loss after 6 to 8 years with 93% follow-up. Ann Surg. 2012 Aug;256(2):262-5. Shikora SA, Bergenstal R, Bessler M, Brody F, Foster G, Frank A, et al. Implantable gastric stimulation for the treatment of clinically severe obesity: results of the SHAPE trial. Surg Obes Relat Dis. 2009 Jan;5(1):31-7. Tweden KS, Knudson MB, Shikora SA, Carey RM. Intermittent neural transmission block of the intra-abdominal vagus induces sustained blood pressure reduction in obese subjects [abstract]. Circulation. 2012;126(21 Suppl 1). (Presented at American Heart Association, Scientific Sessions and Resuscitation Science Symposium. Los Angeles, CA. Nov 3-6 2012). Herrera MF, Toouli J, Kulseng B, Brancatisano R, Zulewski H, Pantoja JP, et al. Treatment of obesity-related type 2 diabetes with vagal blocking [abstract]. Obesity. 2011;19:S185. (Presented at 29th Annual Scientific Meeting of the Obesity Society. Orlando, FL. November 1-5, 2011). Wray N, Kow L, Collins J, Tweden KS, Toouli J. Reduced calorie intake and weight loss during vagal blocking in subjects with obesity-related type 2 diabetes mellitus [abstract]. Obesity. 2011;19:S190. (Presented at 29th Annual Scientific Meeting of the Obesity Society. Orlando, FL. November 1-5, 2011). Tweden K, Toouli J, Herrera M, Kulseng B, Brancatisano R, Pantoja JP, et al. Vagal blocking: treatment of obesity related type 2 diabetes and blood pressure - 18 month results [abstract]. Obes Surg. 2012 Aug;22(8):1170. (Presented at 5th Congress of the International Federation for the Surgery of Obesity and Metabolic Disorders European Chapter. Barcelona, Spain. Apr 26-28, 2012). Shikora SA, Toouli J, Herrera M, Kulseng B, Brancatisano R, Kow L, et al. Midterm results of reversible vagal nerve blocking (VBLOC) in obese patients suffering from type 2 diabetes mellitus (T2DM): the DM2 study [abstract]. Obes Surg. 2014 Aug;24(8):1148-49. (Presented at 19th World Congress of the International Federation for the Surgery of Obesity and Metabolic Disorders. Montreal, QC. Aug 26-30, 2014). Herrera M, Brancatisano R, Keller U, Kulseng B, Toouli BJ, Brancatisano A. Intermittent vagal blockade with an implantable device improves glycemic control in obese subjects with type 2 diabetes. Surg Obes Relat Dis. 2009;5(Suppl 3):S48-9. Herrera MF, Kow L, Pantoja JP, Knudson MB, Tweden KS, Wilson RR. VBLOC® and improvements in co-morbidities in obese subjects during weight loss. Obes Surg [abstract]. 2009;19(983):84. Arterburn DE, Fisher DP. The current state of the evidence for bariatric surgery. JAMA. 2014 Sep 3;312(9):898-9. Sihvonen R, Paavola M, Malmivaara A, Itala A, Joukainen A, Nurmi H, et al. Arthroscopic partial meniscectomy versus sham surgery for a degenerative meniscal tear. N Engl J Med. 2013 Dec 26;369(26):2515-24. Miller FG. The enduring legacy of sham-controlled trials of internal mammary artery ligation. Prog Cardiovasc Dis. 2012 Nov;55(3):246-50. Birch S. A review and analysis of placebo treatments, placebo effects, and placebo controls in trials of medical procedures when sham is not inert. J Altern Complement Med. 2006 Apr;12(3):303-10. Cobourn C, Degboe A, Super PA, Torre M, Robinson J, Jin J, et al. Safety and effectiveness of LAP-BAND AP System: results of Helping Evaluate Reduction in Obesity (HERO) prospective registry study at 1 year. J Am Coll Surg. 2013 Nov;217(5):907-18. Cunneen SA, Brathwaite CE, Joyce C, Gersin K, Kim K, Schram JL, et al. Clinical outcomes of the REALIZE adjustable gastric band-C at one year in a U.S. population. Surg Obes Relat Dis. 2012 May;8(3):288-95. ECRI Institute. Vagus nerve blocking (Maestro System VBLOC) for treating morbid obesity. Plymouth Meeting (PA): ECRI Institute; 2015 Feb. (Health technology forecast). Murton CA, Shankar R, Walker M, Sullivan H. The effects of topiramate and vagal nerve stimulator on seizure control and weight in people with difficult to treat epilepsy [abstract]. Epilepsy Currents. 2013;13:273-74. (Presented at Annual Meeting of the American Epilepsy Society. San Diego, CA. Nov 30-Dec 4, 2012). Powell AG, Apovian CM, Aronne LJ. New drug targets for the treatment of obesity. Clin Pharmacol Ther. 2011 Jul;90(1):40-51. Gallas S, Fetissov SO. Ghrelin, appetite and gastric electrical stimulation. Peptides. 2011 Nov;32(11):2283-9. EnteroMedics. EnteroMedics to provide VBLOC to increased number of patients. Medical Device Daily News. 2015;19(64):3. EnteroMedics. EnteroMedics gets update on VBLOC therapy trained centers and physicians. Medical Device Daily News. 2015;19(69):4. Disclaimer: CADTH Issues in Emerging Health Technologies is a series of bulletins describing health technologies that are not yet used (or widely diffused) in Canada. The contents are based on information from early experience with the technology; however, further evidence may become available in the future. These summaries are not intended to replace professional medical advice. They are compiled as an information service for those involved in planning and providing health care in Canada. While the Canadian Agency for Drugs and Technologies in Health (CADTH) has taken care in the preparation of this publication to ensure that its contents are accurate, complete, and up-to-date, CADTH does not make any guarantee to that effect. CADTH is not responsible for any errors or omissions or injury, loss or damage arising from or relating to the use (or misuse) of any information, statements, or conclusions contained in or implied by the information in this publication or in any of the source documentation. governed by and interpreted in accordance with the laws of the Province of Ontario and the laws of Canada applicable therein, and all proceedings shall be subject to the exclusive jurisdiction of the courts of the Province of Ontario, Canada. Copyright © CADTH 2015. You are permitted to reproduce this document for non-commercial purposes, provided it is not modified when reproduced and appropriate credit is given to CADTH. Views: The views expressed herein are those of CADTH and do not necessarily reflect the views of our funders. Cite as: Vagal nerve blockade for obesity: VBLOC therapy using the Maestro RC2 device. Ottawa: CADTH; 2015 Oct. (CADTH issues in emerging health technologies; issue 139) Contact requests@cadth.ca with inquiries about this notice or legal matters relating to CADTH services.